DISCUS (Discretionary Investment Services Coming Under Scrutiny) the free service for financial advisers which provides content and analysis on the outsourced investment market, has increased its line-up of discretionary investment managers with the addition of EQ Investors. Gillian Hepburn (Discus Director) said, “We are delighted to add EQ Investors to our portfolio of discretionary managers. We are keen to ensure that DISCUS represents a broad spectrum of discretionary managers who offer a range of investment styles, services and propositions. 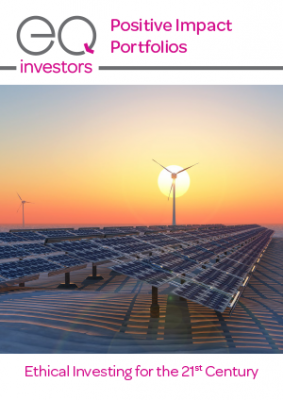 Damien Lardoux, Portfolio Manager at EQ Investors said “The EQ Positive Impact Portfolios, launched in 2012, are a unique proposition for investors who care about how and where their money is invested. The best companies have always been the ones that innovate, find new ways to serve real needs and solve real problems and EQ Investors want to capture these impact investment opportunities. Whilst there were plenty of ethical funds available, we identified a growing demand for a discretionary managed model portfolio approach and the six portfolios are now available on a range of platforms.